Win Once Upon a Deadpool: Smutty superhero now a family affair | SWITCH. From the studio that brought you Anastasia and Ever After comes a fairytale that doesn’t go by the book. Everyone’s favourite disreputable superhero returns with a twist on 'Deadpool 2' that the whole gang can enjoy. Watch Deadpool (Ryan Reynolds) as he teams up with Domino (Zazie Beet), Cable (Josh Brolin) and the rest of the X-Force to prove that family is not an F-word. With over 20 minutes of new footage and jam-packed with surprises, you’ll wonder why the fudge they even bothered with the original version. The 'Once Upon a Deadpool' competition has now closed. Winners will be announced shortly. Competition opens at 5pm AEDT on Sunday 13th January 2019 and closes at 11:59pm AEDT on Sunday 20th January 2019. Five winners will be chosen at random on Monday 21st January 2019. To successfully win, entrants must fulfil the above entry conditions before the time the competition closes. Current members/followers are eligible to enter the competition. Only one entry per person. Only one winner per household. To be a valid winner, the entrant must not have won a prize from SWITCH within the last 28 days. Each winner will receive one Blu-ray copy of 'Once Upon a Deadpool'. By entering, you agree to receive occasional emails from SWITCH in the future. If you decide to unsubscribe from these updates, any further entries will not be applicable. Only Australian residents are eligible to enter. 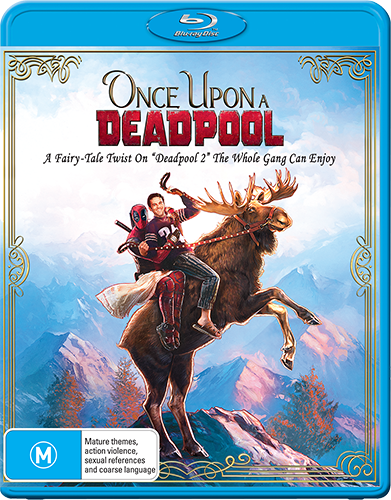 'Once Upon a Deadpool' is available on Blu-ray and Digital on Wednesday the 16th January 2019 from Twentieth Century Fox Home Entertainment.